FILE - Residents walk past a security checkpoint at the close of a open-air market in Kashgar in western China's Xinjiang region, Nov. 4, 2017. Authorities are using detentions in political indoctrination centers and surveillance in efforts to control the Xinjiang region and its Uighurs, a Turkic-speaking Muslim minority Beijing fears could be influenced by extremism. The government in China is further tightening its grip on minority groups in the Uighur Autonomous Region of Xinjiang during the Muslim holy month of Ramadan as it continues to use its deradicalization campaign to suppress local residents, Uighur leaders and human rights activists warn. China started a campaign in April 2017 to arrest local Uighur Muslims accused of holding extremist sentiments and detained them in re-education camps. Estimates of the number of people detained run from 120,000 to as many as 1 million people, according to Uighur activists, human rights groups and others. Dolkun Isa, the head of World Uighur Congress, told VOA the Chinese government recently began jailing more ethnic Uighurs, especially during Ramadan, which started May 16 and will continue until mid-June. "They are continuing to put people in those concentration camps while very few people can come out," Isa told VOA. "No one knows under what terms they are detaining people. No one feels safe." Isa added that the government has prohibited since last year most religious practices of Muslims, including preventing government employees from fasting and visiting mosques during Ramadan, while at the same time organizing alcohol and pork consumption competitions. "If someone at work tries to secretly fast, they will give him food and water during lunch," he added. The U.S. State Department on Tuesday released its annual assessment of global religious freedom, accusing China of aggressively expanding oppression of Uighurs, Tibetan Buddhists, Christians and Falun Gong practitioners. Uighurs and their supporters protest in front of the Permanent Mission of China to the United Nations in New York, March 15, 2018. Members of the Uighur Muslim ethnic group held demonstrations in cities around the world on that day to protest a sweeping Chinese surveillance and security campaign that has sent thousands of their people into detention and political indoctrination centers. Sam Brownback, the U.S. envoy for international religious freedom, said re-education camps of Uighur were "very troubling." "That was a concept you thought was gone decades ago, and [it's] being experienced in a growing amount," Brownback said. Exiled Uighur leader Isa charged that most of the increase in detention had been against young men in Kashgar, located near the border with Kyrgyzstan, Tajikistan, Afghanistan and Pakistan. He said the government had cut off the residents' communication with the world, including restricting their usage of the WeChat social media site. "Tradesmen from Kyrgyzstan and other countries tell us they can't find young men in Kashgar markets anymore. All that is left are old men, women and children. Id Kah Mosque, which used to be a symbol of Kasghar and hosted hundreds of people, is now completely empty," Isa said. The vast region of deserts and mountains in the northwest is home to nearly 22 million people and has the greatest concentration of Muslims in China, estimated to be 11 million Uighurs and other Turkic Muslim minorities. Conflict in the region is not new. The Chinese government has for decades tried to push back against a separatist movement by Uighurs to establish an independent state called East Turkestan. Uighurs accuse the government of forcing demographic changes by settling millions of Han Chinese in the region. The government crackdown increased in recent years because of the rise of the Islamic State and fears of expansion by the Turkistan Islamic Party (TIP) or Eastern Turkistan Islamic Movement (ETIM), which China accuses of being behind several terrorist attacks in the country. China says ETIM and TIP are the same entity, but there are some disagreements about that claim internationally. 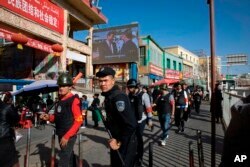 FILE - In this Nov. 3, 2017, photo, armed civilians patrol the area outside the Hotan Bazaar where a screen shows Chinese President Xi Jinping in Hotan, in western China's Xinjiang region. Acting Deputy Assistant Secretary of State Laura Stone said April 18, 2018, that the United States was deeply concerned about China's detention of at least "tens of thousands" of ethnic Uighurs and other Muslims and could take action under the Global Magnitsky Act. ETIM has been sanctioned by the United States, United Nations and the European Union. Chinese authorities, who have not publicly acknowledged the existence of the re-education camps, say their measures are necessary to combat the "three evils" of "ethnic separatism, religious extremism and violent terrorism." The country's officials say they hope to eliminate the sources leading to violent extremist activities. "It's necessary to comprehensively implement measures to address the root cause and improve the anti-terrorism work system," Zhao Kezhi, the state councilor, said Saturday. The official Xinhua News Agency quoted him calling for "deepening anti-terror international cooperation and making efforts to destroy the breeding ground of terrorism." The country in December 2015 passed its controversial anti-terror law, which according to Human Rights Watch gave government agencies "enormous discretionary powers." The government's April 2017 regulations to "prevent extremism" drew international condemnation, with critics saying they violated basic human rights and religious freedom. According to the state-run China Daily, the new law forbids people in the region from wearing full-face coverings and long beards. It also prohibits them from "choosing names in an abnormal way" or "rejecting or refusing state products and services that include radio and television programming." Beijing reportedly has since prohibited Uighur parents from giving their children Islamic names, and it has increased surveillance in the region by confiscating passports and installing mandatory GPS trackers in cars. Human Rights Watch earlier reported that since early 2018, Uighurs also have been forced to welcome Communist Party officials into their homes as part of a government plan to dispatch more than a million government officials to live with local farmer households in southern Xinjiang. It said during the so-called "home stays," families were subjected to political indoctrination and required to provide officials with information about their lives and political views. 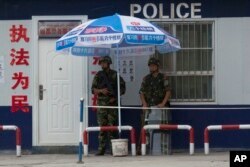 FILE - Chinese paramilitary police stand on duty in front of a wanted poster in the city of Aksu in western China's Xinjiang province, July 17, 2014. China has blanketed parts of Xinjiang, home to Muslim, Turkic-speaking Uighurs, with heavy security. "Muslim families across Xinjiang are now literally eating and sleeping under the watchful eye of the state in their own homes," according to Maya Wang, a senior China researcher at Human Rights Watch. "The latest drive adds to a whole host of pervasive and perverse controls on everyday life in Xinjiang." Experts say China's polices could be driven by fears the ETIM militants could come home after losing global jihad elsewhere. The ETIM group has ties to al-Qaida and other Islamist groups, such as the Islamic Movement of Uzbekistan, Tehrik-i-Taliban Pakistan and the Afghan Taliban. Katibat Turkistani, or the Turkistan Islamic Party in Syria, also has joined the jihadist side in the Syrian civil war, most noticeably in the 2015 fight for Idlib and Hama governorates. "Since the war in Syria is wrapping up, the next stop for TIP militants fighting in Syria is likely going to be Afghanistan," counterterrorism analyst Faran Jeffery told VOA. "This has been worrying China, since it doesn't want these militants in its backyard, especially since there's going to be a real possibility of these militants creating a network within Xinjiang to carry out attacks on Chinese soil," Jeffery added. U.S. forces, who are heavily involved in the Afghan government's counterterrorism efforts, say they will not allow the jihadists to take sanctuary in Afghanistan. Earlier this year, U.S. airstrikes targeted training camps for ETIM in northern Badakhshan province, bordering with China, Tajikistan and Pakistan. Experts say the ultimate solution, however, to address the Uighur jihadist threat should come from the Chinese government. "China needs a radical rethink of its policies toward the Uighurs. Their current approach is inciting retaliation, not calming the situation," according to researcher and human rights activist Carol Anne Grayson. "Some Uighurs attempt to leave the country in the hope of finding freedom elsewhere, Others become radicalized and choose a path of violence, as we have seen in recent knife attacks carried out in Chinese cities," she said. VOA's Mehdi Jedinia contributed to this report.